This chapter discusses approaches to structuring the observation and assessment with focus on the young child’s behavior and developmental level. 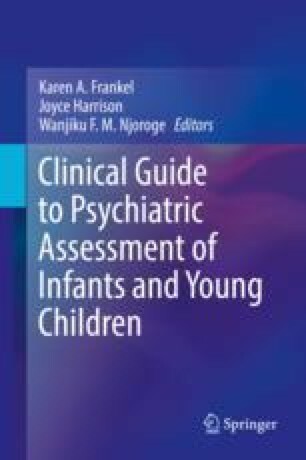 It gives an overview of the clinical tools that can be used in an office setting for the psychiatric assessment of a young child. It addresses the importance of both observation and direct interaction with the child in structured and unstructured ways. It covers the Infant and Toddler Mental Status Exam (ITMSE) in detail as the core assessment tool and provides an overview of other useful, adjunctive assessment tools such as the Autism Diagnostic Observation Schedule (ADOS), the Ages and Stages Questionnaire (ASQ), and the Disruptive Behavior Diagnostic Observation Schedule (DB-DOS). Attention is paid to concrete logistical issues such as office set up, toys, physical boundaries and limit setting as well as cultural considerations.